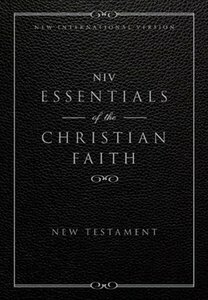 About "NIV Essentials of the Christian Faith (New Testament)"
The world's most popular modern-English Bible, the NIV, in a handy soft cover New Testament eBook edition. Essentials of the Christian Faith includes articles relating to fourteen key tenets for knowing Jesus and living the Christian faith. This inexpensive New Testament Bible is great for outreach and evangelism, featuring text from the world's most popular modern-English Bible translation, the New International Version. It also includes specially written articles that give an overview of fourteen key tenets of the Christian faith, including: ? Why Read the Bible? ? Who Is God? ? Why Does Sin Separate Us from God? ? Who Is Jesus Christ? ? Who Is the Holy Spirit? ? How Can I Turn My Life Around? ? Why Go to Church? ? What Is God's Plan for Me? ? How Can I Use My Gifts? ? What Is Prayer? ? What Is Faith? ? Are We Going to be Judged? ? What Is God's Plan for Salvation? ? How Can I Share My Faith with Others? This inexpensive New Testament Bible is great for outreach and evangelism, featuring text from the world's most popular modern-English Bible translation, the New International Version. It also includes specially written articles that give an overview of fourteen key tenets of the Christian faith, including: * Why Read the Bible? * Who Is God? * Why Does Sin Separate Us from God? * Who Is Jesus Christ? * Who Is the Holy Spirit? * How Can I Turn My Life Around? * Why Go to Church? * What Is God's Plan for Me? * How Can I Use My Gifts? * What Is Prayer? * What Is Faith? * Are We Going to be Judged? * What Is God's Plan for Salvation? * How Can I Share My Faith with Others?